Expand the storage capacity of your HP Z Workstation with the Z Turbo Drive Dual Pro SSD from HP. Equipped with a PCIe 3.0 interface on a half-height, half-length card, this 2TB SSD boasts an active cooling system to help prevent performance throttling due to overheating. You can install multiple Z Turbo Drive Dual Pro cards in a single workstation. Supported systems include the HP Z240, Z440, Z640, and Z840 workstations. 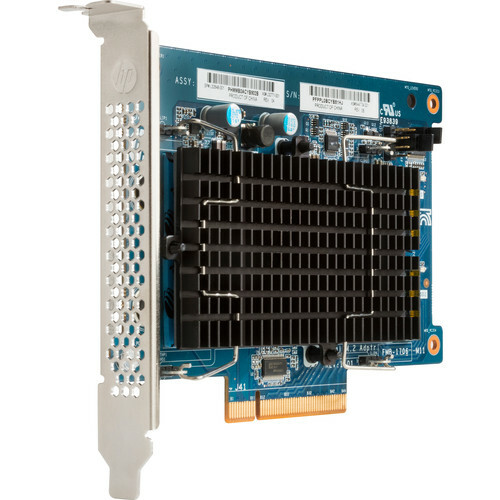 Supports up to four PCIe M.2 SSD modules (NVMe) in one card (PCIe 3.0 x16 slot required). Support for single- and double-sided PCIe M.2 SSDs, up to 110mm in length. One of the M.2 SSD modules on the card can be used as a boot device, and the other device can be used as data storage. Alternatively, both of the M.2 SSD modules can be used as data devices. Multiple HP Z Turbo Drive Dual Pro cards can be installed into HP Z Workstations.